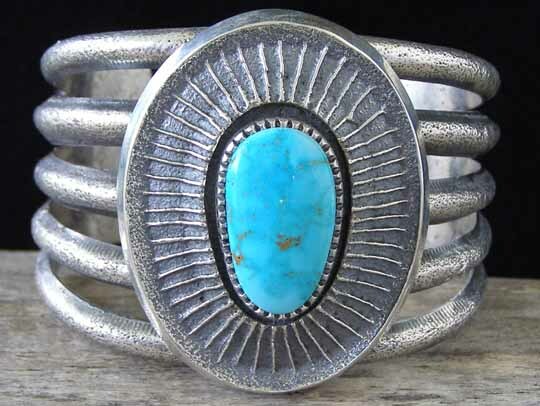 Harrison Jim Sandcast Turquoise Mountain Turquoise Bracelet size 6 5/8"
Not quite forty years old, Harrison Jim is an accomplished silversmith who works in many styles but favors the classic designs best described as Navajo Traditional Revival. His work is done in the old-fashioned way by melting silver, rolling it out and hammering it to form his pieces. He also makes sandcast jewelry and cuts his own turquise stones from rough rock natural turquoise. This is one of the very first sandcast pieces we've acquired from Harrison Jim. This fellow can do it all; from traditional ingot work to carving tufa molds for making sandcast pieces. As with all his work, this is quite simply as good as it gets. His carving is perfectly precise and finely detailed and is also thick and hefty. This piece consists of two separate castings; the split cuff and the large oval medallion which is set with the stone. This is atypical of sandcast pieces, probably because it requires such intense, skilled workmanship to carve two independent molds for assembly after the fact. He set a splendid egg-shaped stone of natural, untreated Turquoise Mountain turquoise from Arizona in the medallion. Hallmarked by a jeweler's scribe inside near one of the terminals as "HJIM" (where the "H" is above the "J" in "JIM"). Medallion: 2" x 1 5/8"
Width of cuff at terminals: 1"